Kathleen Goligher (born 1898) was an Irish medium. Goligher held séances in her own home with seven of her family members. The spiritualist William Jackson Crawford investigated Goligher and took various photographs of her ectoplasm, which he believed was genuine. Crawford believed that Goligher could communicate with spirits that would levitate the table. However the photographs that Crawford took are dubious; the ectoplasm looks like it was made from muslin (which it was revealed to be). Some of the absurd photographs can be seen here  and . 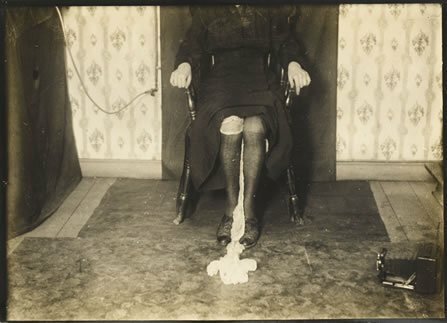 Surprisingly some spiritualist woo websites still claim the photographs depict genuine ectoplasm. Crawford has been described as credulous when it came to the subject of mediumship and "insane" as he had an obsession with underwear. There were no scientific controls in Crawford's séances with Goligher as she and her family members had their hands and legs free at all times. His experiments have been described as non-scientific and have been refuted in detail by skeptics such as Edward Clodd and Harry Houdini. The death-blow to Goligher's mediumship came when the physicist Edmund Fournier d'Albe investigated her and discovered the fraud. During a séance he observed Goligher holding the table up with her foot. He also had observed that the ectoplasm was white muslin between Goligher's feet. D'Albe published The Goligher Circle in 1922 and because of the exposure she retired from mediumship in the same year. Spiritualist cranks such as Brian Inglis and modern day woo-believers on forums tend to ignore the exposure by d'Albe or misrepresent his data on purpose. Edmund Edward Fournier d'Albe. (1922). The Goligher Circle. J. M. Watkins. This page was last modified on 8 December 2017, at 23:58.